Amazon.com description: Product Description: This book constitutes the proceedings of the Third International Conference on Abstract State Machines, B, VDM, and Z, which took place in Pisa, Italy, in June 2012. The 20 full papers presented together with 2 invited talks and 13 short papers were carefully reviewed and selected from 59 submissions. 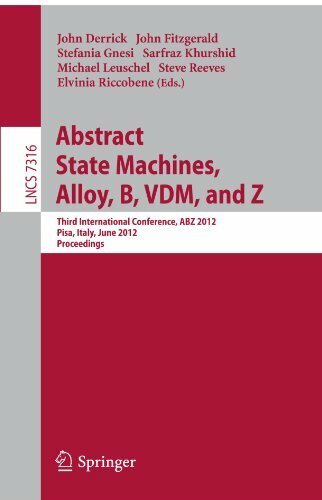 The ABZ conference series is dedicated to the cross-fertilization of five related state-based and machine-based formal methods: Abstract State Machines (ASM), Alloy, B, VDM, and Z. They share a common conceptual foundation and are widely used in both academia and industry for the design and analysis of hardware and software systems. The main goal of this conference series is to contribute to the integration of these formal methods, clarifying their commonalities and differences to better understand how to combine different approaches for accomplishing the various tasks in modeling, experimental validation and mathematical verification of reliable high-quality hardware/software systems. With John Derrick (other contributor), Sarfraz Khurshid (other contributor), John Fitzgerald (other contributor), Stefania Gnesi (other contributor) | from Springer-Verlag New York Inc (July 3, 2012); titled "Abstract State Machines, Alloy, B, VDM, and Z: Third International Conference, ABZ 2012, Pisa, Italy, June 18-21, 2012 Proceedings"
About: This book constitutes the proceedings of the Third International Conference on Abstract State Machines, B, VDM, and Z, which took place in Pisa, Italy, in June 2012.